The DNA amplified by the conventional polymerase chain reaction (PCR) is subjected to two-step detection, electrophoresis, and gel image analysis. Recently, real-time PCR has been developed to detect DNA amplification by measuring fluorescence in real time without the need for a conventional detection process. Real-time PCR systems require thermal cyclers for DNA amplification and fluorescence measurement systems to measure fluorescence in real time. Some of these systems measure fluorescence with a camera. However, owing to the simultaneous handling of fluorescence excitation and emission for dozens of tubes, there is a limit to the size, cost, and assembly of optics. Recently, cameras have been continuously developed as imaging devices for rapidly developing open platforms, and their performance has also been rapidly improved. 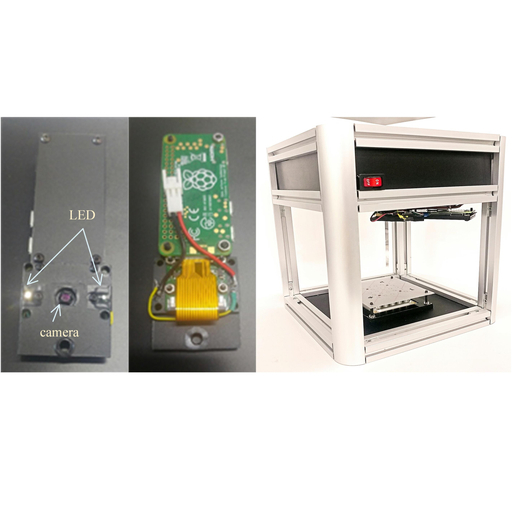 In this paper, we propose a low-cost, compact fluorescence detection system for real-time PCR systems using open platforms and cameras. To simplify the optics, the entire tube was divided into four quadrants to minimize the field of view. In addition, the images of the tubes far from the field-of-view center were overlapped to compensate for the reduction in signal-to-noise ratio due to oblique photography. The proposed system measured the fluorescence detection performance on the basis of the amount of DNA using various fluorescent substances. Seul-Bit-Na Koo, Chan-Young Park, Yu-Seop Kim, Hye-Jeong Song, and Jong-Dae Kim, Real-time Polymerase Chain Reaction System Using an Open Platform Camera, Sens. Mater., Vol. 31, No. 2, 2019, p. 269-278.